AT 218 WHITEHEAD ST., IN A SPACE THAT once housed virtual reality rides and had blacked-out windows, a cook’s dream has emerged – an open kitchen with high-end appliances (including a drool-worthy induction range), meticulously curated table and kitchenware for sale, and some of the best and most interesting beers and wines money can buy. 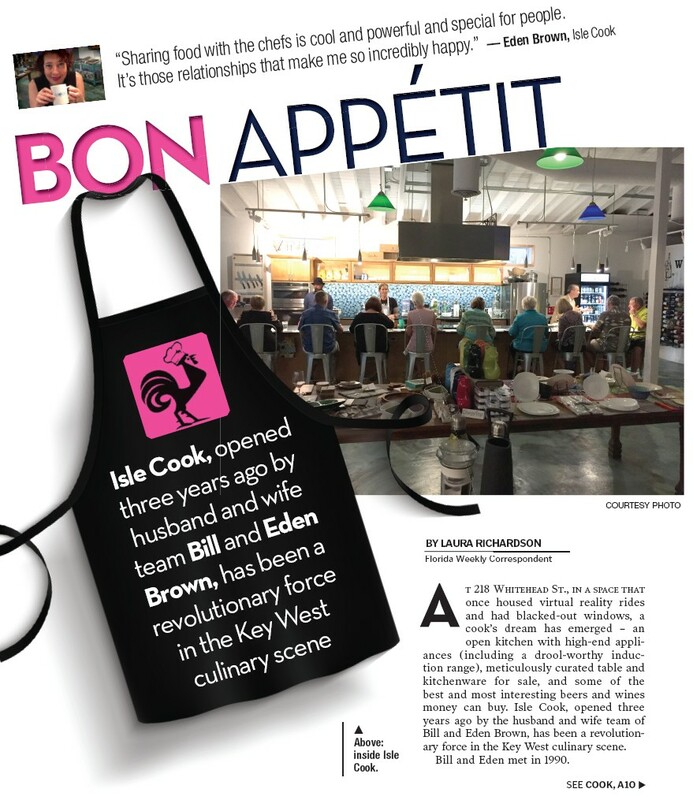 Isle Cook, opened three years ago by the husband and wife team of Bill and Eden Brown, has been a revolutionary force in the Key West culinary scene. Bill and Eden met in 1990. Uniquely, Bill and Eden are both licensed clinical psychologists with master’s degrees and doctorates in clinical psychology. They married in 1993 and moved to the D.C. area, where Eden is from. Eden worked for the VA Hospital in D.C. for five years, specializing in combat trauma. Bill worked in public mental health. They opened up a private practice together, which they ran for 10 years until Bill went to work for Argosy University in an administrative capacity and Eden decided to detour to film school. Bill Brown and customers enjoy some wine. 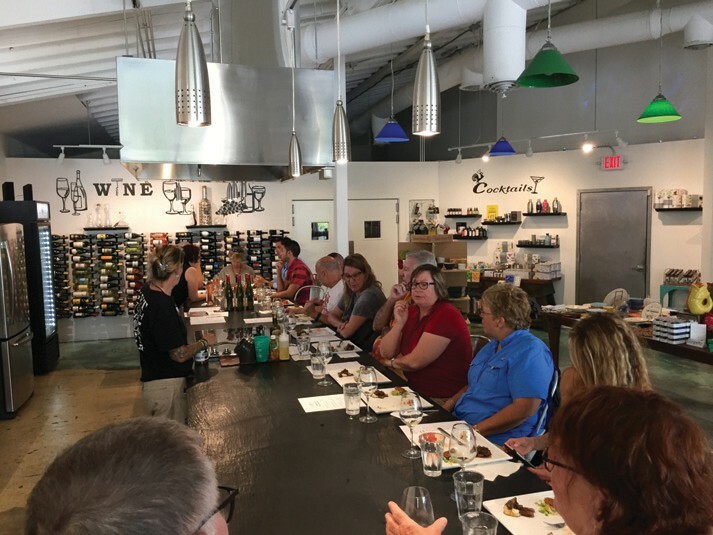 So, two clinical psychologists meet, fall in love, get married, have a couple career detours and speed bumps and end up opening a restaurant store slash cooking school slash chefs’ table in Key West? Huh? Isle Cook offers both cooking experiences and the ability to purchase cookware. 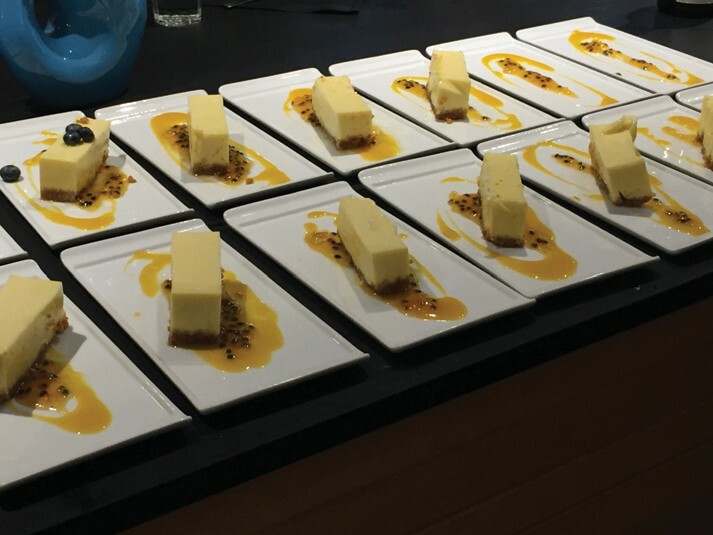 An Isle Cook chef’s dessert creation. And that they have. Since the doors opened in 2014, chefs from across Key West have utilized Isle Cook as a playground for innovating their cuisine and actually interacting with the people they serve nightly in their restaurants. Isle Cook is designed for conversation. 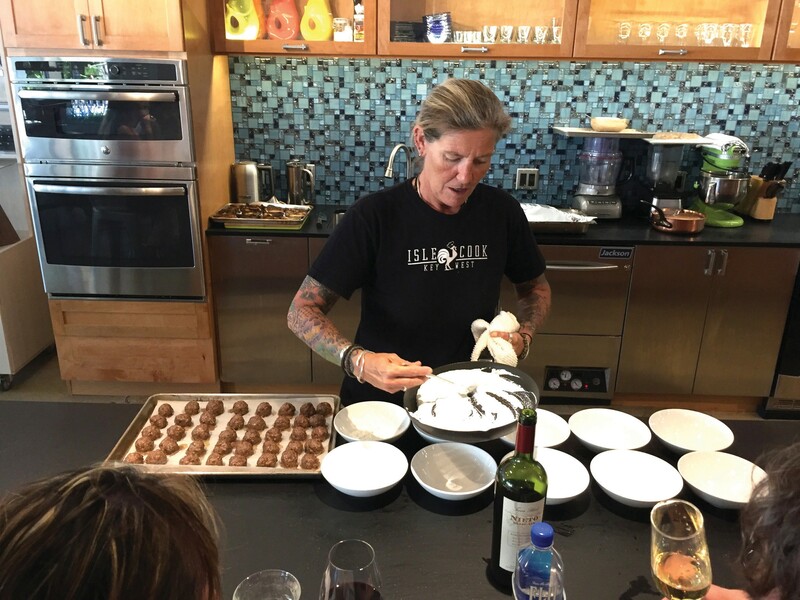 It would be impossible to talk about Isle Cook’s success without talking about the gastronomic genius behind the culinary side of the business – chef Martha Hubbard. 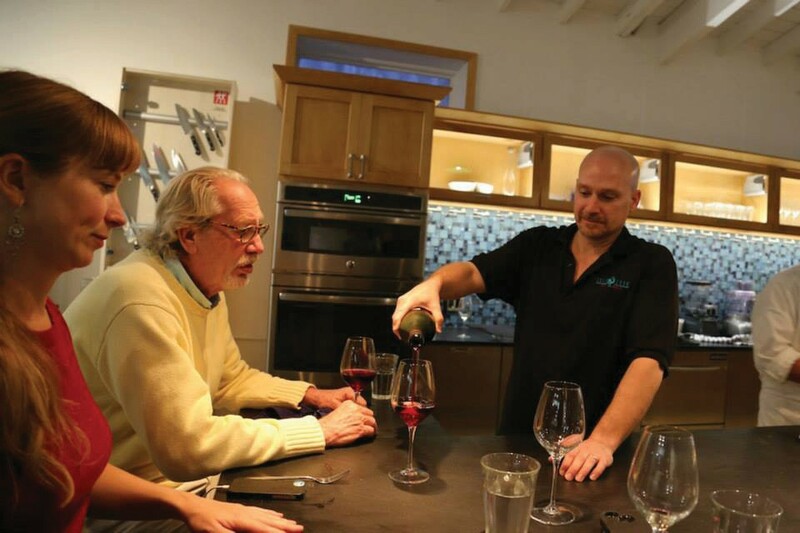 From the time they opened in February 2014, Bill and Eden hounded Martha, a locally renowned chef with major culinary chops, to come cook for them. She finally acquiesced and did her first guest chef stint in June of that year. Since she started at Isle Cook, Martha has implemented a program of hands-on cooking lessons covering everything from basic knife skills to entire Thanksgiving dinners. This year, for example, Martha’s island-themed Thanksgiving lessons will span the first three Thursdays in November and will focus on Caribbean and Keys influences. “It’s not traditional by any stretch of the imagination,” Martha says, “but it’s familiar!” Martha has also had a huge hand in creating the Conch Revival Picnic, with support from the Key West Art and Historical Society, which will be happening for the third year in January. Ultimately, opening Isle Cook has been a fantastic way to bridge the gap between the chefs in town and their customers in a setting more intimate than the average restaurant. “Our guests are so lovely and wonderful and interested and their questions are amazing and thoughtful,” Eden gushes. “Our guest chefs are always surprised that the diners are actually interested in what they have to say. There’s not a bad seat here and we like it that way. We want them to be small intimate events. 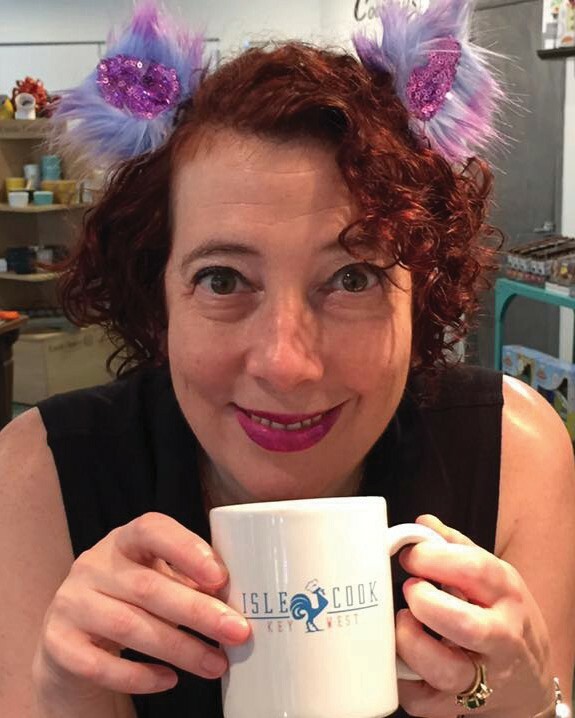 What is relevant is how Isle Cook is completely altering the nature of the dialog between Key West’s cooks and its culinary enthusiasts (which is just a fancy term for “eaters) and is focused on making that dialog fun and exciting by hosting unique events and classes. For example, for Fantasy Fest this year Isle Cook has prime parade-viewing real estate and will host a dinner based on the 1983 Chicago’s World Fair featuring foods invented during that time. Distinctive, thought-provoking, and delicious – Isle Cook in a nutshell. 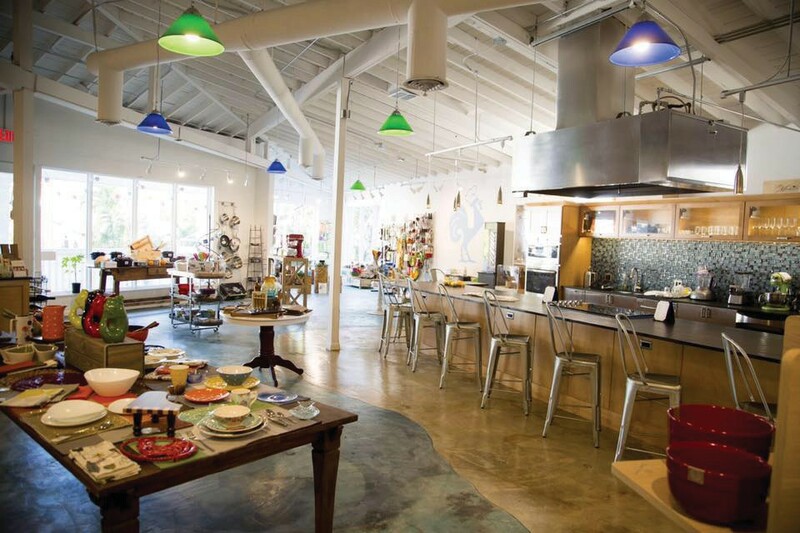 For a full list of Isle Cook’s events and to learn more about its culinary philosophy, visit its website at www.islecookkeywest.com. And if you’re in the market for cookware that you can pretty much guarantee no one else has (or just a glass of wine and fascinating conversation), check out their offerings at 218 White St. Fascinating story!!! Congratulations fellow Sweet Briar College grad!! !